Saturday 10th June is World Gin Day! What better way to celebrate than with that classic drink a gin and tonic. It is one of my absolute favourite drinks, it’s tasty, iconic and something about a gin and tonic feels very refined and classy. World Gin Day will be celebrated throughout the day in pubs and bars to mark this delicious spirit. To mark world gin day, I thought I’d use Gordon’s London Dry Gin to create this gin and tonic layer cake. 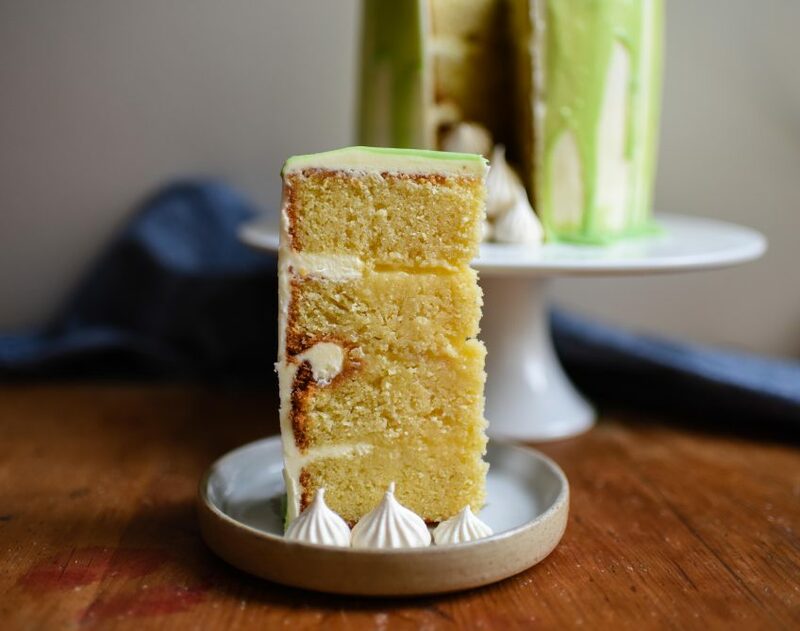 Layers of citrus sponge, soaked in a gin syrup, with lemon buttercream, gin and lime curd and a drippy glaze to decorate. This is such a delicious cake and it turned out so much better than I could have hoped for. The citrus bursts in this cake, work so well with the flavours of a gin and tonic which is one the best summer cocktails. I have really started to love making layer cakes like this one, at first I was a bit scared of them, they always look so beautiful and those tutorial videos make it look so easy. However I promise you, it’s like anything, you just need to practice and know a few inside tricks and it’ll get easier. Then you can start producing wonderful layer cakes for friends and family. Firstly, make sure you weigh out your cake mix when you add it to the tins so that you can be sure you have divided it evenly, this will help when trying to arrange the cooked cake. 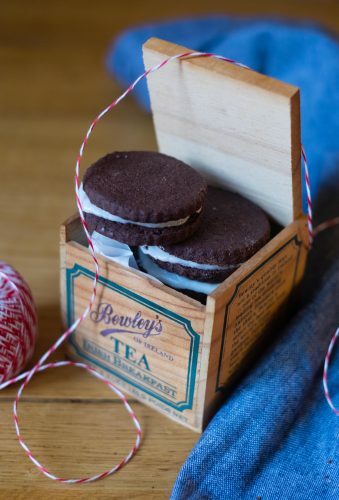 For your top layer of cake, be sure to use a piece of cake that was at the bottom of one of the tins, this will give you a great even surface and if necessary, trim the tops of the cakes to make them more level and easier to balance on each other. 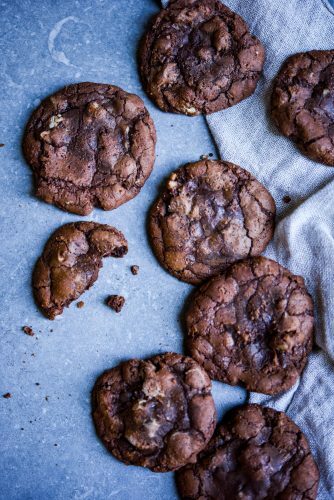 A crumb coat is a thin layer of buttercream or icing that you spread over a cake to secure the crumbs and then the cake is chilled. This helps keep the crumbs stuck to the cake, so that when the final layer of buttercream is applied, it will be easier to spread and the crumbs and cake will not get smeared into the icing. Invest in some disposable piping bags as this will make decorating the cake easier, also a bent palette knife and a cake scraper will be invaluable if you want to make cakes like this again and again. 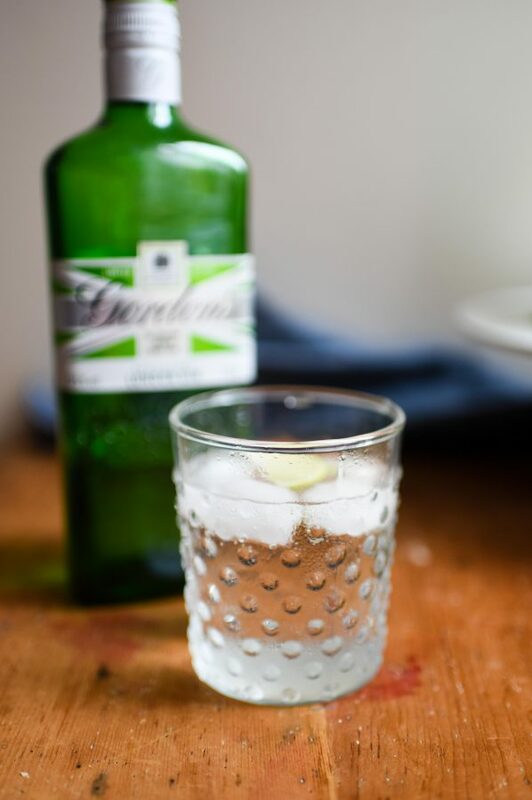 Of course, if it does all go horribly wrong, you can just relax with a Gordon’s London Dry gin and tonic, try this recipe from thebar.com. 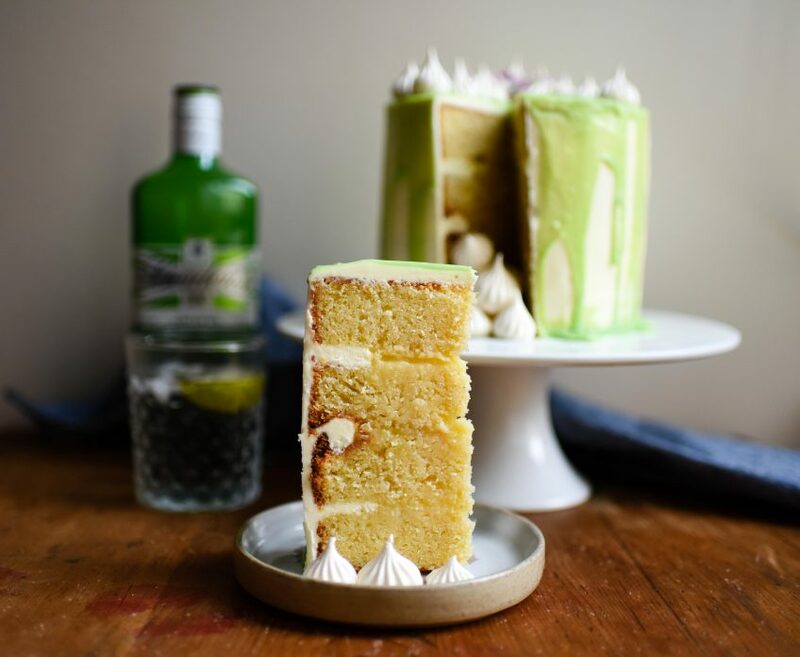 This is a stunning gin and tonic layer cake, complete with a gin and lime curd, a lemon buttercream and a gin syrup. Begin by making the lime curd, combine all of the ingredients together in a medium size saucepan and heat gently over a medium-low heat. Stir continually, until the mixture starts to thicken. Do not let it boil or catch on the bottom of the pan. Strain into a bowl through a sieve and then place the strained curd into a sterilised jar. To make the cake, grease and line the base of two deep 6 inch cake tins and pre-heat the oven to 160C. Place the butter and sugar in the bowl of a stand mixer with the beater attached. Cream them together until they become pale and fluffy. Slowly add the eggs to the creamed sugar and butter, until it is combined. Then add the lemon and lime zest and juice and mix again. Then add the flour and baking powder, sifting it into the eggy mixture. Mix until combined, you may need to scrape down the sides of the bowl with a spatula to mix it all in. When the flour is completely combined, add the milk and give it a final mix, before dividing it between the two prepared tins. Weigh the mix so that it is evenly distributed between the two pans. Bake the cake for 1 hour until golden or until a cocktail stick comes out clean. While the cake is baking, make the syrup that will be used to soak the cake, place the sugar, gin and lemon juice in a saucepan and heat until the sugar has dissolved, don't let it boil. When the cake is cooked, remove it from the oven and leave it in their tins, take the syrup and pour it evenly over both the cakes, using all the syrup. 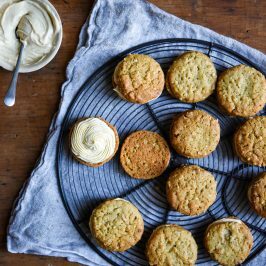 Allow the cakes to cool before removing them from their tins. 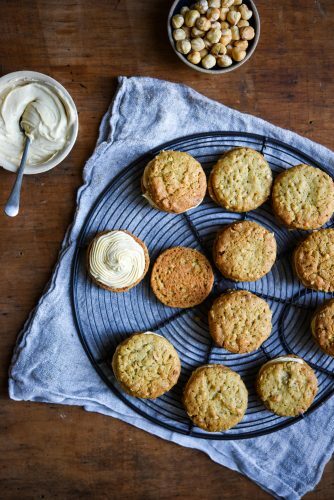 Next make the buttercream, sift the icing sugar into the bowl of a stand mixer with the beater fitted, add the butter and mix on low until the two ingredients combine together, allow the butter and icing sugar to come together until it is light and fluffy. Add the lemon juice and mix it again, taste the buttercream and if necessary add more lemon juice and mix again. Place the buttercream into a disposable piping bag and snip off the end to reveal a hole about 1cm. Next make the glaze, add all the ingredients, apart from the coloured cocoa butter into a clean bowl and heat over a Bain-Marie or a pan filled with water. Heat until the chocolate has melted and it has combined. Do not let it get too hot. 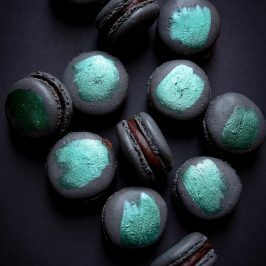 Heat the coloured cocoa butter to the instructions on the packet and add a few drops to your chocolate glaze, until you achieve the desired colour. Allow the glaze to cool to below 30C before using. To make the meringues, whisk the eggs at a low speed in the bowl of a food mixer until they have reached the soft peak stage and are almost whipped. Add the sugar a spoonful at a time and keep whisking the eggs until they form a stiff peak. 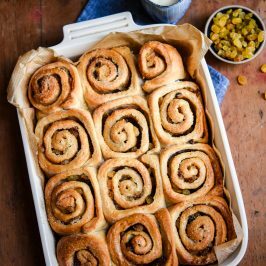 Place the meringue in a piping bag fitted with a french tip and pipe 'kisses' onto a baking sheet lined with greaseproof paper. Bake in an oven pre-heated to 120C for 40-50mins until they have a hard shell, but hardly any colour. To assemble the cake, get a cake stand or board that you intend to build the cake on, place a blob of lemon buttercream in the middle. Cut both the cakes in half horizontally and place the first layer of cake on the stand. Pipe a ring of buttercream around the edge. Take the lime curd and stir in the 35ml of gin until combined. 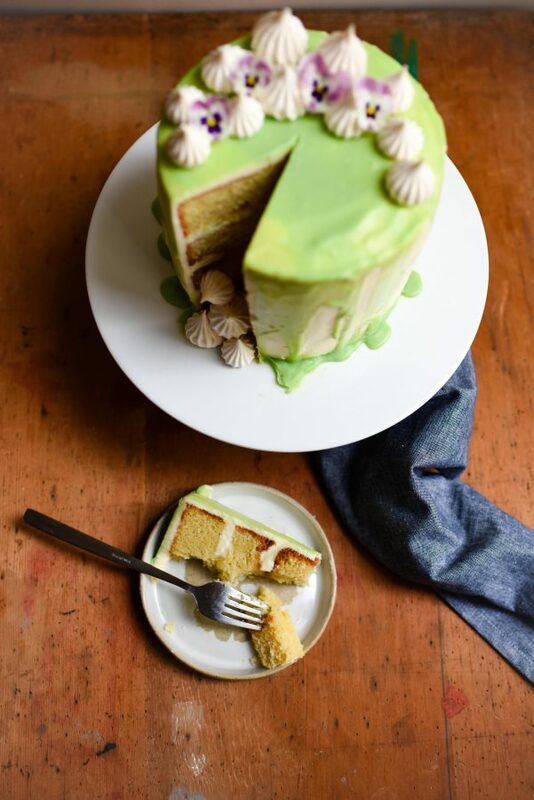 Spoon lime curd onto the cake inside the ring of buttercream until you have an even layer. 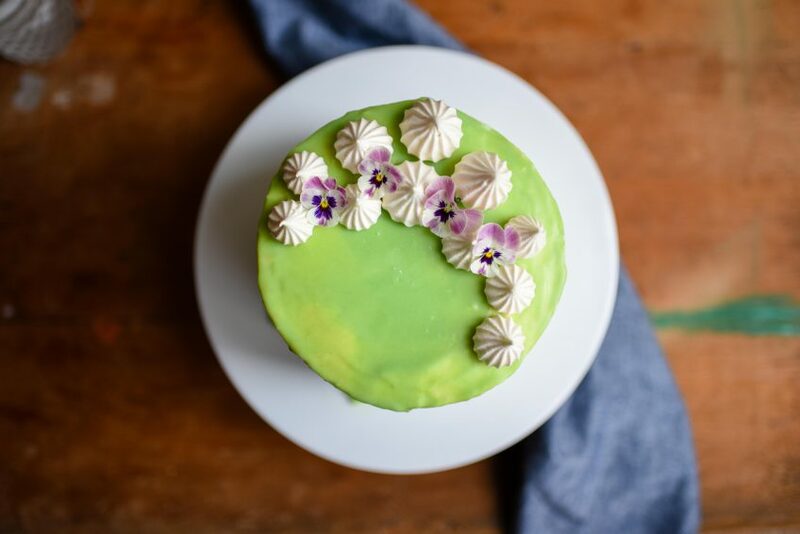 Place another layer of cake on top and level it, pipe a ring of buttercream and again fill it with a layer of lime curd. 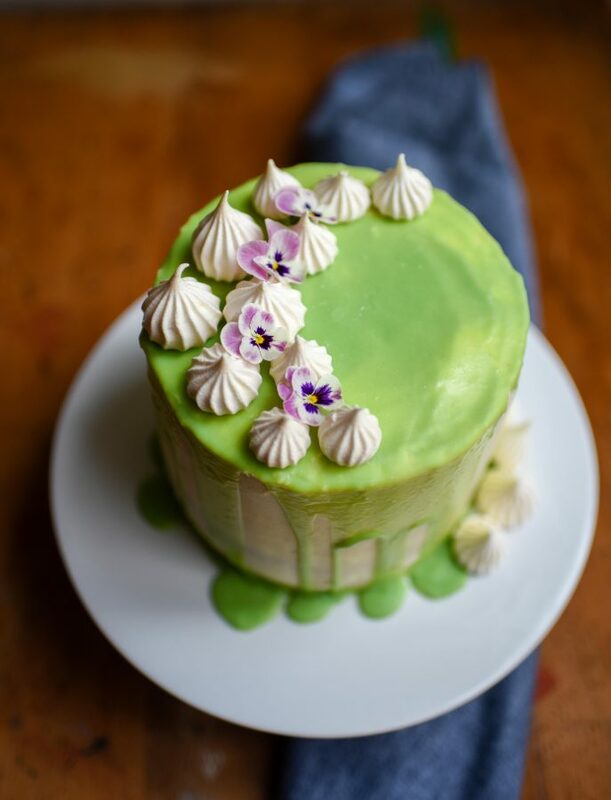 Top with the third layer of cake pipe a ring of buttercream and again fill it with a layer of lime curd. Take the final layer of cake and ensure the top layer is the bottom of one of the cakes so that you have a really flat surface for the top of your cake. Pipe a thin layer of buttercream over the cake and using a stepped palette knife, smooth a crumb layer all of the cake, so that you can still see the cake through the icing, but the crumbs will all be secured. Place in the fridge to chill for 30 minutes. Remove the cake from the fridge and decorate with the remaining buttercream until the cake is smooth and you can no longer see the cake beneath. Take the drippy glaze and when it is below 30C and not too runny, using a spoon drizzle it over the top of the cake and the edges so it falls down the sides. Decorate with the meringues and edible flowers if you like. The recipe will make more lime curd than you need for this recipe, but it will keep in the fridge for up to two weeks. The recipe will give you more meringue kisses than you need, but these can be served with the cake, or eaten as a snack. 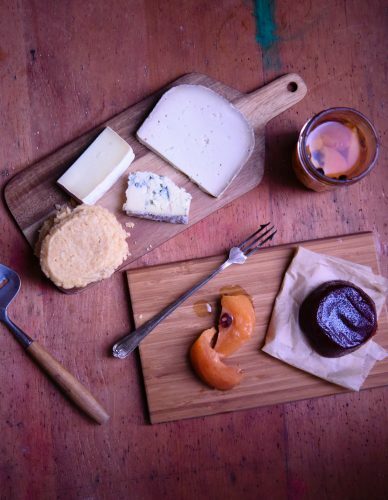 I’m a big fan of baking with gin, take a look at these cronuts if you need more inspiration. What will you be doing to celebrate World Gin Day? This post was sponsored by thebar.com. All opinions expressed are my own. Hi. I’m just wondering how long this cake would keep for and still taste its best? I’m afraid I’ve fallen victim to the lack of comma! It’s a 6 inch cake tin (that’s the diameter) that is deep, something like this: https://www.amazon.co.uk/Prochef-6-inch-Teflon-Loose-Graphite/dp/B00FG0WOLM/ref=sr_1_5?s=kitchen&ie=UTF8&qid=1524471442&sr=1-5&keywords=6+inch+cake+tins. I added the cocoa butter until I had the colour I desired as the cocoa butter already had pigment in it. 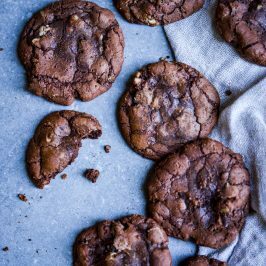 The only thing I can suggest is that you mix the cocoa butter and powdered chocolate food colouring together until you have an intense colour and then add that to the white chocolate, which will lighten the colour. I hope that all helps – any other questions please let me know. Going to be making this cake for my mums birthday, can you substitute food colouring for the coloured cocoa butter as I can’t find it anywhere! Hi Lauren, I’m afraid normal food colouring won’t work. It’s not fat soluble so may leach out of the finished glaze. If you are in the UK, Squires kitchen. Amazon and eBay all sell coloured cocoa butter. Hope the cake goes well. I’m hoping to try this recipe tonight for my boyfriends birthday cake! Looks amazing. Can you clarify what type of sugar is best to use for the syrup? Hi, as you heat the sugar, you can use either caster sugar or granulated sugar. I’ll update the recipe, thanks for letting me know. Hope your boyfriend enjoys the cake and has a great birthday! The cake turned out perfect, we did the taste test today and it’s so delicious!! 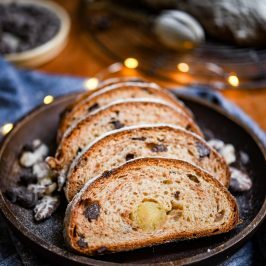 Wonderful recipe, thank you!! Hi Kirstie – so glad you enjoyed the cake and it went down a storm! It was so good Jodie – you’d have loved it! So pretty! No doubt delicious too. It looks extra elegant with all those layers. It’s really good Michelle, I had to give half away to stop me eating it all! that is a fantastic cake, and world gin day is something I can really get behind. Exactly Helen – if I had my way, every day would be World Gin Day. You would love it, it’s so zingy and refreshing. I haven’t seen gin and tonic CAKE. This is fabulous. I definitely need to make this for gatherings this summer! This cake is so beautiful! Look at those gorgeous layers! Thank you Catherine – this is such a tasty cake and the 6 inch size means it isn’t crazily huge. I have never even thought of using gin in a cake!!! It tastes fantastic Julie – you need to try it! This cake is beautiful and sounds amazing! I didn’t even know gin had it’s own day. Wow..guess I need to celebrate! This is such a stunning cake! A showstopper! I can only imagine how tasty it is, too. 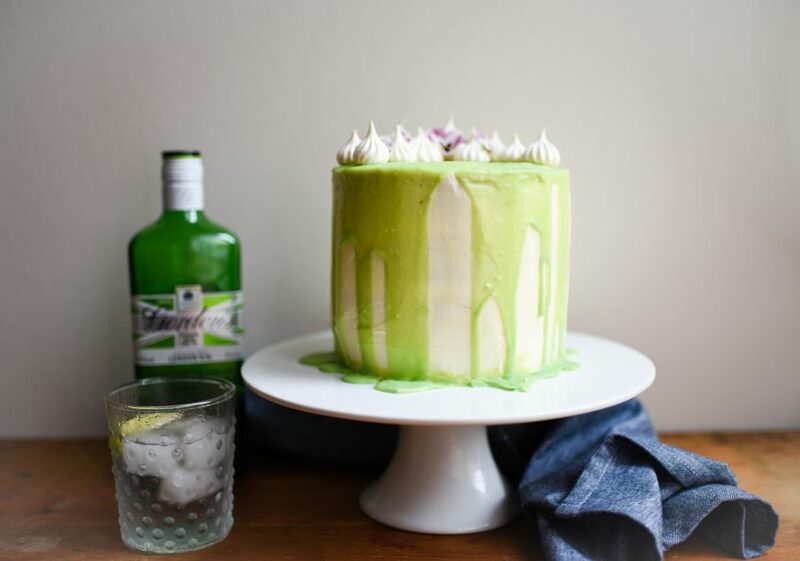 I love the idea of gin in a cake. Thank you Valentina – it’s a truly amazing cake and gin really works. I really did Emma – it’s for everyone with a discerning palette that truly appreciates gin! Thanks for such a lovely comment. 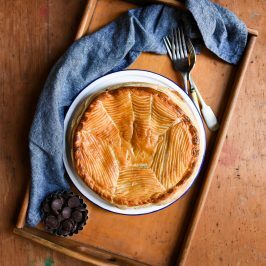 Great recipe to celebrate this 10th June!!! Thank you Maria, so glad you like it.